Blowout Sale! Save 68% on the Syba NC-2 UFO 2.1 Dual Driver Headphone with Built-In Amplifier and In-Line Microphone, Black Model (OG-AUD63051) by Oblanc at Pacs BG. MPN: OG-AUD63051. Hurry! Limited time offer. Offer valid only while supplies last. Cushioned leatherette ear cup headphones great for comfortable long lasting computer gaming, listening to music, or watching a movie on your tablet. 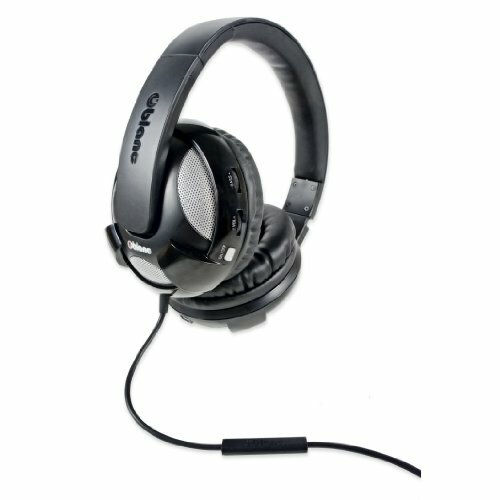 Cushioned leatherette ear cup headphones great for comfortable long lasting computer gaming, listening to music, or watching a movie on your tablet. The amplified subwoofer provides you with a fuller, cleaner theater sound that you can feel. Acoustic design amplified 2.1 stereo channel with independent bass and volume control will give your headphones and extra -"BOOM". Internal headphone ampifitler helps power the dual driver, 30mm and 40mm driver, within the headset. Controls for both Volume and Bass level. If you have any questions about this product by Oblanc, contact us by completing and submitting the form below. If you are looking for a specif part number, please include it with your message.